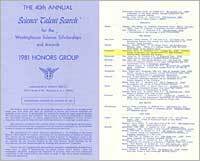 In 1978, a 14-year-old named V.A. Shiva Ayyadurai developed a computer program, which replicated the features of the interoffice, inter-organizational paper mail system. He named his program “EMAIL”. Shiva filed an application for copyright in his program and in 1982 the United States Copyright Office issued a Certificate of Registration, No. TXu-111-775, to him on the program. 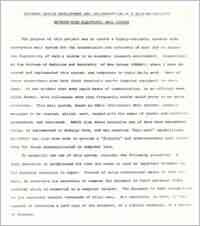 First US Copyright for "EMAIL, Computer Program for Electronic Mail System" issued to V.A. Shiva Ayyadurai. As required by the Regulations of the Copyright Office, he deposited portions of the original source code with the program. Prominent in the code is the name “EMAIL” that he gave to the program. He received a second Certificate of Registration, No. TXu-108-715, for the “EMAIL User’s Manual” he had prepared to accompany the program and that taught unsophisticated user’s how to use EMAIL’s features. Recently however, a substantial controversy has arisen as to who invented email. This controversy has resulted in an unfortunate series of attacks on Shiva. Part of the problem is that different people use to the term to mean somewhat different things. In the summer of 1978, Shiva had been recruited for programming assignments at the University of Medicine and Dentistry of New Jersey (UMDNJ) in Newark, New Jersey. One of his supervisors, Dr. Leslie P. Michelson, recognized his abilities and challenged him to translate the conventional paper-based interoffice and inter-organizational communication system (i.e., paper-based mail and memoranda) to an electronic communication system. Systems for communications among widely dispersed computers were in existence at the time, but they were primitive and their usage was largely confined to computer scientists and specialists. TIME Article, "The Man who Invented Email", an interview with V.A. Shiva Ayyadurai. Shiva envisioned something simpler, something that everyone, from secretary to CEO, could use to quickly and reliably send and receive digital messages. Shiva embraced the project and began by performing a thorough evaluation of UMDNJ&apos;s paper-based mail system, the same as that used in offices and organizations around the world. Article in The Verge reviewing the facts around V.A. 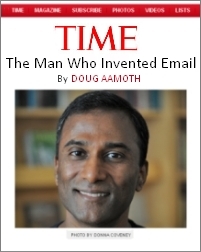 Shiva Ayyadurai's invention of email. He determined that the essential features of these systems included functions corresponding to “Inbox”, “Outbox”, “Drafts”, “Memo” (“To:”, “From:”, “Date:”, “Subject:”, “Body:”, “Cc:”, “Bcc:”), “Attachments”, “Folders”, “Compose”, “Forward”, “Reply”, “Address Book”, “Groups”, “Return Receipt”, “Sorting”. 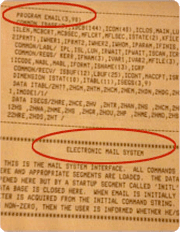 These capabilities were all to be provided in a software program having a sufficiently simple interface that needed no expertise in computer systems to use efficiently to “Send” and “Receive” mail electronically. It is these features that make his program “email” and that distinguish “email” from prior electronic communications. Shiva went on to be recognized by the Westinghouse Science Talent Search Honors Group for his invention. The Massachusetts Institute of Technology highlighted his invention as one among four, in the incoming Freshman class of 1,040 students. His papers, documenting the invention of email were accepted by Smithsonian Institution. These are facts based on legal, governmental and institutional recognition and substantiation, and there is no disputing it. 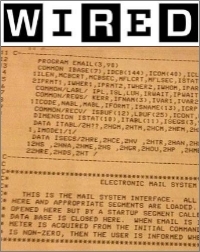 A copy of code sample in Wired magazine showing V.A. 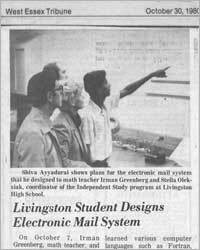 Shiva Ayyadurai's invention of email in 1978. The original text message, electronic transfer of content or images, ARPANET messaging, and even the “@” sign were used in primitive electronic communication systems. While the technology pioneers who created these systems should be heralded for their efforts, and given credit for their specific accomplishments and contributions, these early computer programs were clearly not email. V.A. 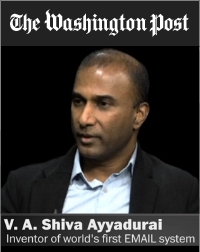 Shiva Ayyadurai describes his path to The Smithsonian Museum in an interview with The Washington Post. Based on false claims, over the past year (since the acceptance of Shiva's documents into the Smithsonian), industry insiders have chosen to launch an irrational denial of the invention. There is no direct dispute of the invention Copyright, but rather inaccurate claims, false statements, and personal attacks waged against Shiva. Attackers are attempting to discredit him, and his life's work. He has received threatening phone calls, unfair online comments, and his name and work has been maligned. It is but a sad commentary that a vocal minority have elected to hijack his accomplishment, apparently not satisfied with the recognition they have already received for their contributions to the field of text messaging. Following the Smithsonian news, they went into action. They began historical revisionism on their own “History of Electronic Mail” to hide the facts. They enlisted “historians” who started discussions among themselves to redefine the term “email” so as to credit their own work done prior to 1978, as “email”. 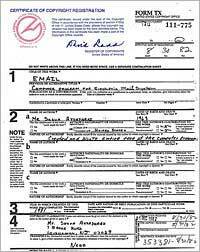 More blatantly, they registered the InternetHallofFame.Org web site, seven (7) days after the Smithsonian news and issued a new award to one of their own as “inventor of email”. Through the PR machine of BBN (a multi-billion dollar company), they were proclaimed as the “king of email”, and “godfather of email”. These actions were taken to protect their false branding and diminish the accolades and just recognition Shiva was beginning to receive. Shiva’s news likely threatens BBN’s entire brand, which has deliberately juxtaposed “innovation”, with the “@” logo, along with the face of their mascot, the self-proclaimed “inventor of email”. They have removed damaging references to eminent Internet pioneers of the time such as MA Padlipsky who exposed their lies, and showed that BBN’s mascot, was not the “inventor of email”. Some industry insiders have even gone to the extent, in the midst of the overwhelming facts, to now attempt to confuse the public that "EMAIL" is not "email". It is a fact that the term "email", the juxtaposition of those five characters "e", "m", "a", "i" and "l", did not exist prior to 1978. 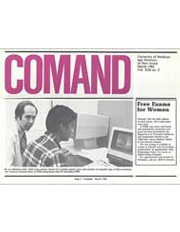 The naming of the software program EMAIL in all capitals was because at UMDNJ, the names of software programs, subroutines and variables written in FORTRAN IV used the upper-case naming convention. Moreover, at that time, the use of upper case for the naming of programs, subroutine and variable names, was also a carry over from the days of writing software programs using punch cards. The fact is EMAIL is email, upper case, lower case, any case. Sadly, some of these individuals have even gone further, deciding that false allegations are insufficient to make their case and have resorted to character assassination of the most debased nature including removal and destruction of facts on Wikipedia to discredit Shiva as an inventor of any kind. Threatening and racist emails telling him “to hang himself by his dhothi”, blogs referring to him as a “flagrant fraud”, and comments that EMAIL was “not an invention” are beyond disbelief, and reflect a parochial attitude that innovation can only take place in large universities, big companies, and the military. Of course a claim such as “I invented email” will leave anyone open to criticism and doubt, and as some suggest “hatred”. In this case, the victim has not made a “claim”, but rather been recognized by the government and top educational institutions in the world as an inventor. 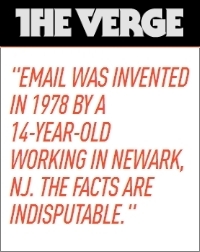 Regardless of the vitriol, animosity and bigotry by a vocal minority, a simple truth stands: email was invented by a 14-year-old working in Newark, NJ in 1978. This is a fact. Innovation can occur, any place, any time, by anybody. Beyond the invention of email in 1978, Dr. V.A. Shiva Ayyadurai, who holds four degrees from MIT, is a Fullbright Scholar, MIT-Lemelson Awards Finalist and Westinghouse Science Talent Search Honors Award recipient, has continued his work as both an inventor and systems scientist across a broad range of fields from media to medicine, art and technology. After inventing email, he went on to create Arts Online - the first internet portal for artists, in 1993. After winning a competition categorizing email for the White House, he started EchoMail, a company that provided Global 2000 companies an enterprise platform for email and social media management. His deep interest in medicine and biology led him to create CytoSolve in 2007, a company dedicated to revolutionizing drug development through in-silico modelling. His dedication as an educator at MIT and to the general public led him to create Systems Visualization, a new course he pioneered at MIT, which has now become one of the most popular institute-wide interdisciplinary courses. To educate medical doctors, healthcare and holistic practitioners on the bridge between eastern and western medicice, he created Systems Health™, a revolutionary education program that serves as a gateway for integrative medicine. Dr. VA Shiva, to share his love of systems, developed vashiva.com to serve as an educational source for the general public to learn how systems are the basis of understanding their bodies, their business, and the world around them. To support innovation among youth, he started Innovation Corps, a project of his center - International Center for Integrative Systems. In his birthplace in India, he deployed Tamilnadu.com, a portal dedicated to organizing content featuring the arts and culture of the state of Tamil Nadu. More than anything else, as the Inventor of Email, his achievements provide an inspiring message to youth across the world - be it in inner cities or villages. Professor Henry Mullish of the Courant Institute of Mathematical Science at New York University (NYU), a visionary, who recognized the importance of training America's future engineers and scientists in computer programming, organized a highly selective and intensive 8-week program. This program had 40 openings for students in the New York area. Shiva was one of the few who was fortunate to get accepted, after hearing about the program from Martin Feuerman, a colleague of Meenakshi Ayyadurai (Shiva's mom) at UMDNJ. The program offered both class room training by NYU graduate students and faculty, as well as a rigorous lab component for each of the classes in FORTRAN, PL/I, COBOL, SNOBOL, BASIC, Digital Circuit Design, ARTSPEAK. All of this was done in punch cards on old CDC main frames. Shiva graduated with Distinction and was one of the youngest of the entire group. He also won a special Computer Arts Award for artwork he developed using ARTSPEAK, one of the earliest computer graphic languages. The FORTRAN IV compiler at the time being used at UMDNJ had a six-letter character limit on naming variables and subroutines. The operating system had an additional limit of five characters for the name of main programs. “EMAIL” was chosen as the name of the computer program for the system which would emulate the interoffice, inter-organizational mail system. 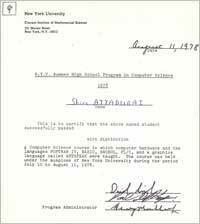 This printout is just one example of the nearly 50,000 lines of code (there are other such examples on this website), that was submitted to the US Copyright Office and donated to the Smithsonian. This article appeared in the West Essex Tribune entitled “Livingston Student Designs Electronic Mail System” on October 30, 1980. His independent study teacher and coordinator at Livingston High School, Stella Oleksiak, was persistent with the Superintendent of Schools, the Principal and other teachers, who originally did not want to allow a student to travel back and forth to work in Newark, NJ, for a variety of reasons. Through her efforts and the support of Dr. Leslie P. Michelson, Shiva was allowed, starting in 1978, to do the independent study. This article was an important one, for it demonstrated to the local school board and others, that the concept of Independent Study could lead to fruitful results. Each day, Shiva traveled nearly 30 miles to UMDNJ. 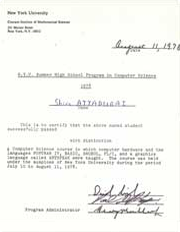 This is the original of the Westinghouse Award Entry that Shiva submitted to the Westinghouse Science Talent Search Committee in 1981. 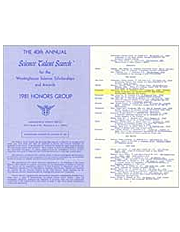 The review of this document is what was used to determine the issuance of the Westinghouse Science Talent Honors Award. By reviewing this document, one can see some of the details of his thinking, design approach and thoughts on where email could go in the future. 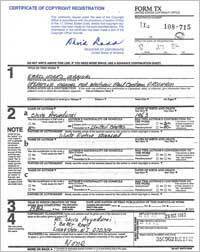 The document is typewritten. This was at a time when programs like MS Word, Powerpoint, Adobe, etc. did not exist. 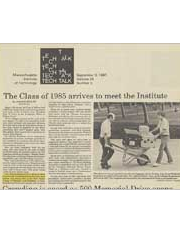 The incoming Class of 1985 to MIT entered in the Fall of 1981. The front-page article in Tech Talk, MIT's official newspaper highlighted the work of four incoming students, one being the invention of Email. Even while at MIT, Shiva continued, for a few more years to consult as a Research Fellow for UMDNJ to continue additional work on Email. In 1982, the U.S. 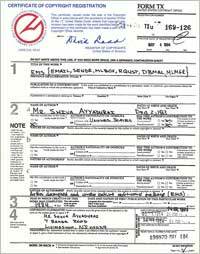 Copyright Office issued TXu-111-775, the first Copyright for Email, to Shiva Ayyadurai. At that time, the only protection available for software was through Copyright. The U.S. intellectual property laws, at that time, treated software similar to music, art or literary work. The original Copyright application was submitted in 1980. Dr. Leslie Michelson, Ph.D., a former physicist was Shiva's mentor, who provided this unique opportunity and access to infrastructure at UMDNJ as well as other colleagues twenty to fifty years older than him. Dr. Michelson recruited Shiva to be a Scholar in his Lab after hearing about his work and results at the NYU Summer program, offered by Henry Mullish. Initially, there was no pay offered, but free lunch at the UMDNJ cafeteria. Later on, he earned $1.25 per hour. The screen you see on the left was the size of the display that one had to work with. 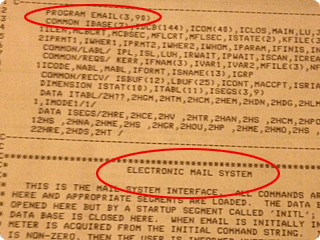 Every software system needs a User's Manual, so did the world's first email system. At that time, Shiva was everything on the project: software engineer, network manager, project manager, architect, quality assurance AND technical writer. 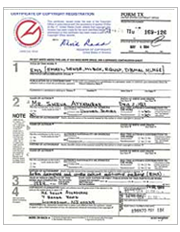 The User's Manual for which he received Copyright TXu-108-715 was also tested. He wrote and updated multiple versions based on feedback from his user base of doctors. It had to be easy-to-read and accessible to all. In 1984, the U.S. 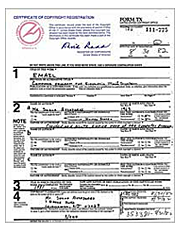 Copyright Office issued TXu-169-126, the first Copyright for EMS (EMAIL Management System), to (V.A.) Shiva Ayyadurai. The EMAIL copyright had been awarded to Shiva two years earlier. This copyright recognized his additional contribution for creating all the internal tools needed by system administrators to maintain EMAIL and messages long-term, e.g. archiving, password management, etc. Even in 1984, the only protection available for software was through Copyright. The U.S. intellectual property laws, at that time, treated software similar to music, art or literary work. 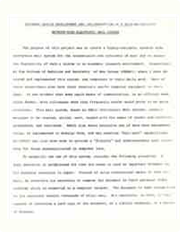 The original Copyright application was submitted in 1980. 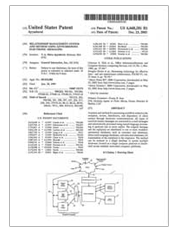 This patent was awarded in recognition for Shiva's contribution to create a holistic and integrated system for electronic management of on-line relationships through the use of ANY asynchronous electronic messages. 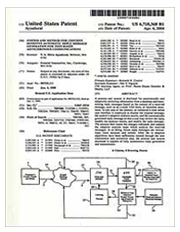 This broad patent was issued after considerable deliberation by the USPTO. Shiva, at one point, was asked to appear in Washington, DC at the USPTO to explain aspects, given the broad protection for all asynchronous messaging he was seeking. 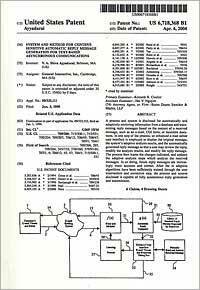 In 2004, over 20 years, after creating the worlds' first email system, Shiva was issued U.S. Patent #6,718,368 for inventing a method for automatically analyzing an email and formulating a response. 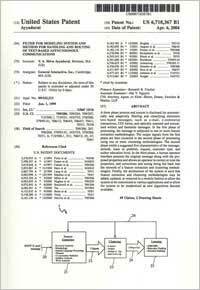 This patent was issued to Shiva's company General Interactive, LLC, which developed the product EchoMail. EchoMail became the leading application for intelligent message analysis, sorting and routing used by such companies as Hilton, QVC, Citigroup and others. 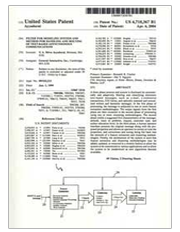 The patent enabled the automatic and adaptive retrieval of information from a database while enabling the transmission of reply messages based on content of a received message. 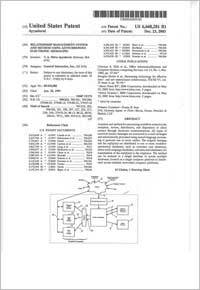 This patent was awarded to Shiva for developing a unique method to route incoming text-based asynchronous communications. The system applied pattern analysis methods of Feature Extraction, Clustering and Learning, deploying a hybrid and integrated systems model of nearly 19 different technologies in a unique frame work. VA Shiva at the age of 14, Newark, 1978. As a Lecturer at the MIT, 2012. © 2012 - 2018. International Center for Integrative Systems. All Rights Reserved.